In the 70’s my training group and I used to train all over Frensham ponds and The flashes and Hankley common. There is an old soldier drop zone at Hankley common, which became for us synonymous with hard hill training….! Many ‘hill sessions’ were carried out here as a group… I believe it has bonded us all forever! I remember the day my coach decided to add extra resistance to the session… He wrapped a 14lb diving belt in a towel, (to stop it hurting my hips! ) And then I ran up and down the hills with it strapped around my waist! 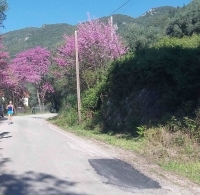 Running here in Corfu with cooler temperatures and low humidity is giving me the same feeling I had when unstrapping from ‘that belt’ and bounding off like a gazelle! The road wound up, out of the village where we turned back after four miles on Saturday… It climbed up and wound around the mountain side… up and up and then seemed to be taking us in the opposite direction to anything resembling a loop!